The above picture is of an Ohio sunrise which are not really seen except on the lake. A literal pain in my neck kept me home through three nice weekends. Then came the bad weather. Then came work. Finally I had a weekend and I found Findley full! Poop! East Harbor had a bunch of sites open but was fairly full. I decided to try it. I ended up on site 211. Not the best but great enough for me! The dogs are normally barky anytime they see another dog. Not here. Everyone has a dog or two or three. Toodles and Odo blew their "dog" fuse. They accepted all the other dogs as camping dogs and all was well. We took lots of walks on the trails and throughout the campground. The weather was low to mid 80 and high 60s at night. The shower houses here are great. They are clean with great water pressure. Showering in the box is always doable, but the shower house is easier and quicker. We saw lots of deer. But the below deer was the first we've seen that didn't really care to move for Toodles and Odo. They were so confused! Deer are supposed to run! Did a flashback when walking past the playground by the beach. I do remember the kids and I playing here in 1988! 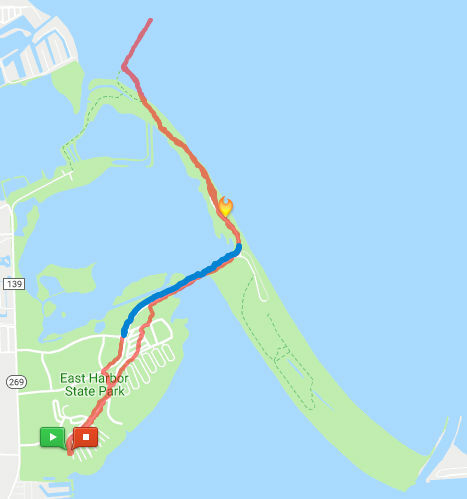 MapMyRun did not contain map data and I cannot add the maps of our forst three days. Very disappointed! I just learned that I have to enable the GPS on the phone to get the map. Poop. Friday: 3.11 miles in the evening. Saturday: 4.29 miles in the morning and 2.85 miles in the evening. Sunday: 5.7 miles in the morning and 3.45 miles in the evening. Monday: 5.47 in the morning. 24.77 miles for the trip. The Meadow Trail looks like a waste of time but it was HUGE for the dogs. Not a meadow any more, it is more a "woods" trail and there were sooooo mmmmaaaaannnnnyyyyy animals. It was like a maze. We would have paid admission to get in!